DDS - Sysops' Pets - Reptiles! 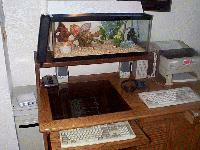 These pets are owned by Bryan Turner of Vagabond Software and Pegasus Flight BBS. Bryan has contributed much to the BBS world in the form of mainly freeware BBS doorgames and utilites and always has innovative ideas for new software. 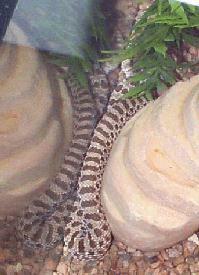 See photos of his other pets on the various pages here. Snake - Western Hog Nose about 12 Inches long. 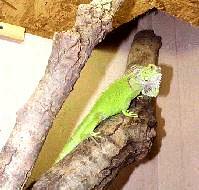 Its name (via Brianna) is "Snakie"
Iguana - (again named by Brianna) "Lizzie"
With tail it is about 2.5 Feet. 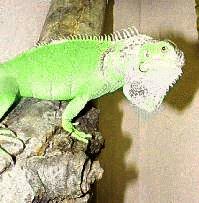 It is a 6 month old Green Iguana. When it is full grown it will be about 6 ft long. When Bryan first got it it was in a 10 Gal tank which it took about 3 weeks to out grow. 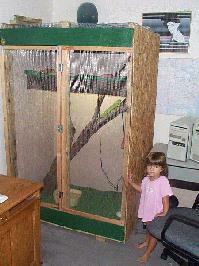 The picture of Bryan's daughter, Brianna, standing next to the cage is the cage that he built and will need to expand on when she gets a little bigger.